UPDATE: Some belated pictures to accompany the interview. If you think keeping a pinball blog is hard work, you should probably try and produce a pinball magazine. I've attempted both and the blog is easier by a country mile. 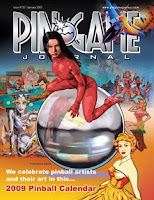 So why on earth would anyone want to produce a magazine dedicated to pinball machines in the 21st century? Let's find out and interview the man that normally does the interviewing on the PGJ. The Pinball Blog. So you're Jim Schelberg, producer of the PinGame Journal. What do you do 9-5? Jim Schelberg. I'm a podiatrist, I believe you may still call us chiropodists over there in the UK. Four years at college then another four years studying before I graduated and that was 1977! TPB. What made you start a pinball magazine? JS. Basically my wife wanted to buy me a pinball machine for my 40th birthday (bear in mind I'm 60 this October!). She did some research and contacted Gordon Hasse who was a big force in the hobby back then and a big woodrail collector. 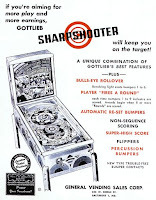 In then meantime we bought a Gottlieb Sharp Shooter from a local place. While I was there I noticed Gary Flower's book and I saw it said he competed annually at an event in Chicago. I had no idea what Expo was! I rang the Chicago tourist board to find out more and they had no idea what I was talking about! Luckily someone in the room overheard the conversation and said something like "Oh, that's the pinball thing out by the airport". Eventually we found some more information and I contacted Rob Berk. That year I ended up at expo for 3 hours between other plans. I also picked up a copy of Pinball Trader, produced by Dennis Dodel and subsequently had letters published. A couple of years down the line it turned out they needed help to produce the magazine and I got myself geared up with all the computers. The next I heard two guys from California were buying the magazine. I rang Dennis to tell him I was all set up to help him and he used the immortal line "Why dont you start one of your own". With an advert in Pinball Trader and not much in the way of internet or email back then I was amazed that 85 people sent me money for a magazine which didn't exist. $26 for a subscription! I produced the 1st issue in May of 1991. TPB. Does your family understand the pinball thing and how important is their support? JS. My wife, although she understands it is not thrilled with the amount of time it takes and the amount of time it takes me away from other activities. To start with I produced 12 issues a year, pulling all-nighters to get it done - insane! She was not happy. The kids back then were young and got to come with me to Chicago. 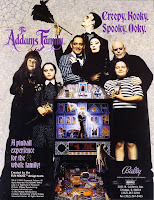 We had a tour round the Williams factory with Pat Lawlor when The Addams Family was in production. The kids were of course fine with it, the wife less so! An article appeared in the local newspaper "Podiatrist's Hobby has Wife Crying Tilt". After that I changed to a more casual schedule where things get done when they get done. Not in a mean way, but everything has to fit around the family! TPB. We've heard a bit of how you started as a collector, and we already know your first machine, but what else do you have and what your last purchase? JS. 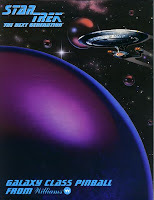 I stopped buying quite a while ago, but I think my most recent was Star Trek: The Next Generation - which I bought NEW! I have around 60 games from woodrails, including Steve Kordek's first machine Triple Action and a 1940 'Metro' to Star Trek. TPB. Do you still get the same buzz from producing the magazine as you always have? JS. Yes I do. The 1st issue of course was pretty cool, but I still love seeing the magazine in print. I always get a paper copy sent to me as soon as possible so I can see what it feels like. There are a number of other great things that come with the magazine. Like the interviews, getting to see what goes on behind the scenes. One of the best things is the factory visits where I can see what games are on their way and how they progress. What gets added and what gets taken away and why. I've talked to some great people, designers and artists and all sorts. TPB. 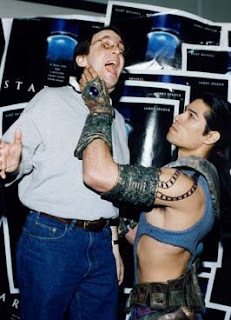 You must have met some interesting celebrities over the years, any highlights? JS. I interviewed James Doohan who played Scotty in Star Trek which was great for me as he was such a cool guy and I'm a big Star Trek fan! TPB. And what about in pinball? Who would you say within the hobby/industry, has been the most influential to you? And any particular pinballing highlights yourself? JS. Difficult, but if I had to pick I would say Roger Sharpe. Certainly early on, but even now, he knows how and what to write. He's written for GQ magazine and Play Meter and has done a LOT of writing. He'd be the guy I'd go an see at Williams. As for highlights I used to go to Chicago 3 times a year, flying in and out on the same day. FOUR pinball factories in a day! In the morning I could go to Premier, then Williams where I would have lunch with some of the guys, then I'd pop into see Alvin G on the way over to Data East. I had to drag myself away to make the flight! I'd have a tape recorder running because so much could happen in a day and I'd not remember half of it - great, I loved it! TPB. I know you visit Expo and other trade shows, how important is industry support for the PGJ and has it changed over years as the manufacturers disappeared and even more recently with the global economic slowdown? JS. Industry support is important and thankfully I've always had it. All the companies and all the people have been extremely helpful and open all the way through from the beginning. One day I asked the guys at Data East if I could take some photos of the assembly line and it was late. Everybody left and I was the only guy in the factory! I was told to lock the door on the way out! Even at Stern today I have a free reign over the workings. If Stern were to stop, which by the way from what I've heard is nothing like the case, there are still so many other things going on, so many stories, that I don't think it would make a huge difference to the PGJ. TPB. Tell us about the production schedule for an issue of the PGJ. JS. Hah! There are tons of people who help, amazingly so, sending articles and helping in a number of ways but it all boils down to one man, one computer. I often think about going to the Detroit News office, throwing some magazines on the desk, take some pictures and say it's my production office, but it's just not like that. I've had some help with the graphics lately, not because I can' t do it myself, but my helper can work a lot faster than me. The product just has to come when I have the time and the mental time to wrap my head around sitting down. I've never really timed it, I'd be afraid to put a clock to it. Even when several of the pieces are done, I've worked every night until I've fallen asleep for 2 weeks solid. The calendar took longer. I dropped everything I normally do and it took me a month even with help on the graphics side. TPB. 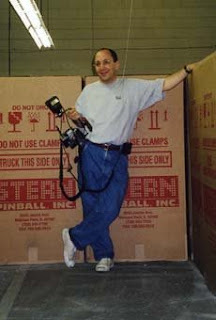 Finally, please sum up your involvement in pinball in one word or sentence. JS. The pinball hobby is great because it allows you to do so many different things other than just collect or play ... Including publishing a magazine! I interviewed Jim on the phone as he was driving to Chicago and then onwards for another pinball-packed weekend. Hopefully I didn't miss too much and apologies if I heard dates wrong or got anything else mixed up! I think I got most of what he was saying and he's certainly had a great insight into the industry over the last 20 years. 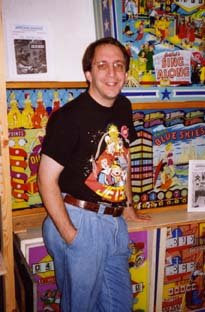 Many thanks to Jim for taking the time to answer our questions and we have more Pinball Heroes coming soon.